Dominoes is a game played with small tiles called dominoes. A domino is a rectangular tile with a line in the middle that separates it into two sides. Each side has a number of black spots. The number of spots is different on each domino. Some dominoes have a side that is blank. The games possible with these objects resemble card games. 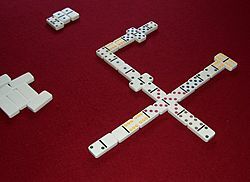 European-style dominoes are traditionally made of bone or ivory, or a dark hardwood such as ebony, with contrasting black or white pips (inlaid or painted). Alternatively, domino sets have been made from many different natural materials: stone (e.g., marble, granite or soapstone); other hardwoods (e.g., ash, oak, redwood, and cedar); metals (e.g., brass or pewter); ceramic clay, or even frosted glass or crystal. These sets have a more novel look, and the often heavier weight makes them feel more substantial; also, such materials and the resulting products are usually much more expensive than polymer materials. Modern commercial domino sets are usually made of synthetic materials, such as ABS or polystyrene plastics, or Bakelite and other phenolic resins; many sets approximate the look and feel of ivory while others use colored or even translucent plastics to achieve a more contemporary look. Modern sets also commonly use a different color for the dots of each different end value (one-spots might have black pips while two-spots might be green, three red, etc.) to facilitate finding matching ends. Occasionally, one may find a domino set made of card stock like that for playing cards. Such sets are lightweight, compact, and inexpensive, and like cards are more susceptible to minor disturbances such as a sudden breeze. Sometimes, dominoes have a metal pin (called a spinner or pivot) in the middle. The traditional set of dominoes contains one unique piece for each possible combination of two ends with zero to six spots, and is known as a double-six set because the highest-value piece has six pips on each end (the "double six"). The spots from one to six are generally arranged as they are on six-sided dice, but because blank ends having no spots are used, seven faces are possible, allowing 28 unique pieces in a double-six set. However, this is a relatively small number especially when playing with more than four people, so many domino sets are "extended" by introducing ends with greater numbers of spots, which increases the number of unique combinations of ends and thus of pieces. Each progressively larger set increases the maximum number of pips on an end by three, so the common extended sets are double-nine, double-12, double-15, and double-18. Larger sets such as double-21 can theoretically exist, but are rarely seen in retail stores, as identifying the number of pips on each domino becomes difficult, and a double-21 set would have 253 pieces, far more than is normally necessary for most domino games even with eight players. The oldest confirmed written mention of dominoes in China comes from the Former Events in Wulin (i.e. the capital Hangzhou) written by the Yuan Dynasty (1271–1368) author Zhou Mi (1232–1298), who listed pupai (gambling plaques or dominoes), as well as dice as items sold by peddlers during the reign of Emperor Xiaozong of Song (r. 1162–1189). Andrew Lo asserts that Zhou Mi meant dominoes when referring to pupai, since the Ming author Lu Rong (1436–1494) explicitly defined pupai as dominoes (in regard to a story of a suitor who won a maiden's hand by drawing out four winning pupai from a set). The earliest known manual written about dominoes is the 《宣和牌譜》 (Manual of the Xuanhe Period) written by Qu You (1341–1437), but some Chinese scholars believe this manual is a forgery from a later time. In the Encyclopedia of a Myriad of Treasures, Zhang Pu (1602–1641) described the game of laying out dominoes as pupai, although the character for pu had changed, yet retained the same pronunciation. Traditional Chinese domino games include Tien Gow, Pai Gow, Che Deng, and others. The 32-piece Chinese domino set, made to represent each possible face of two thrown dice and thus have no blank faces, differs from the 28-piece domino set found in the West during the mid 18th century. Chinese dominoes with blank faces were known during the 17th century. Many different domino sets have been used for centuries in various parts of the world to play a variety of domino games. Each domino originally represented one of the 21 results of throwing two six-sided dice (2d6). One half of each domino is set with the pips from one die and the other half contains the pips from the second die. Chinese sets also introduce duplicates of some throws and divide the dominoes into two suits: military and civil. Chinese dominoes are also longer than typical European dominoes. The early 18th century had dominoes making their way to Europe, making their first appearance in Italy. The game changed somewhat in the translation from Chinese to the European culture. European domino sets contain neither suit distinctions nor the duplicates that went with them. Instead, European sets contain seven additional dominoes, with six of these representing the values that result from throwing a single die with the other half of the tile left blank, and the seventh domino representing the blank-blank (0–0) combination. Ivory dominoes were routinely used in 19th-century rural England in the settling of disputes over traditional grazing boundaries, and were commonly referred to as "bonesticks". Domino tiles, also known as bones, are twice as long as they are wide and usually have a line in the middle dividing them into two squares. The value of either side is the number of spots or pips. In the most common variant (double-six), the values range from blank or no pips to six. The sum of the two values, i.e. the total number of pips, may be referred to as the rank or weight of a tile, and a tile with more pips may be called heavier than a lighter tile with fewer pips. Tiles are generally named after their two values; e.g. deuce-five or five-deuce (2–5 or 5–2) are alternative ways of describing the tile with the values two and five. Tiles that have the same value on both ends are called doubles, and are typically referred to as double-zero, double-one, etc. Tiles with two different values are called singles. Every tile belongs to the two suits of its two values, e.g. 0–3 belongs both to the blank suit (or 0 suit) and to the 3 suit. Naturally the doubles form an exception in that each double belongs to only one suit. In 42, the doubles can be treated as an additional suit of doubles, so the double-six (6–6) belongs both to the six suit and the suit of doubles. The most common domino sets commercially available are double six (with 28 tiles) and double nine (with 55 tiles). Larger sets exist and are popular for games involving several players or for players looking for long domino games. The number of tiles in a set has the formula for a double-n set. The most popular type of play are layout games, which fall into two main categories, blocking games and scoring games. Most domino games are blocking games, i.e. the objective is to empty one's hand while blocking the opponent's. In the end, a score may be determined by counting the pips in the losing players' hands. In scoring games, the scoring is different and happens mostly during game play, making it the principal objective. A popular version played predominantly in Singapore, referenced as Hector's Rules, allows for playing double tiles on opponents' hands and awards a bonus play of an additional tile immediately after playing a double tile. The most basic domino variant is for two players and requires a double-six set. The 28 tiles are shuffled face down and form the stock or boneyard. Each player draws seven tiles; the remainder are not used. Once the players begin drawing tiles, they are typically placed on-edge in front of the players, so each player can see their own tiles, but none can see the value of other players' tiles. Every player can thus see how many tiles remain in the opponent's hands at all times during gameplay. One player begins by downing (playing the first tile) one of their tiles. This tile starts the line of play, in which values of adjacent pairs of tile ends must match. The players alternately extend the line of play with one tile at one of its two ends; if a player is unable to place a valid tile, they must keep on pulling tiles from the stock until they can. The game ends when one player wins by playing their last tile, or when the game is blocked because neither player can play. If that occurs, whoever caused the block gets all of the remaining player points not counting their own. Players accrue points during game play for certain configurations, moves, or emptying one's hand. Most scoring games use variations of the draw game. 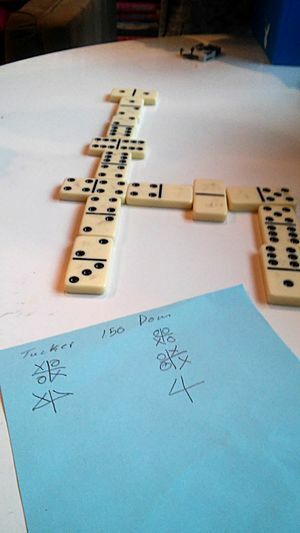 If a player does not call "domino" before the tile is laid on the table, and another player says domino after the tile is laid, the first player must pick up an extra domino. In a draw game (blocking or scoring), players are additionally allowed to draw as many tiles as desired from the stock before playing a tile, and they are not allowed to pass before the stock is (nearly) empty. The score of a game is the number of pips in the losing player's hand plus the number of pips in the stock. Most rules prescribe that two tiles need to remain in the stock. The draw game is often referred to as simply "dominoes". Adaptations of both games can accommodate more than two players, who may play individually or in teams. Muggins played with multicolored tiles: The doubles serve as spinners, allowing the line of play to branch. The line of play is the configuration of played tiles on the table. It starts with a single tile and typically grows in two opposite directions when players add matching tiles. In practice, players often play tiles at right angles when the line of play gets too close to the edge of the table. The rules for the line of play often differ from one variant to another. In many rules, the doubles serve as spinners, i.e., they can be played on all four sides, causing the line of play to branch. Sometimes, the first tile is required to be a double, which serves as the only spinner. In some games such as Chicken Foot, all sides of a spinner must be occupied before anybody is allowed to play elsewhere. Matador has unusual rules for matching. Bendomino uses curved tiles, so one side of the line of play (or both) may be blocked for geometrical reasons. In Mexican Train and other train games, the game starts with a spinner from which various trains branch off. Most trains are owned by a player and in most situations players are allowed to extend only their own train. In blocking games, scoring happens at the end of the game. After a player has emptied his hand, thereby winning the game for the team, the score consists of the total pip count of the losing team's hands. In some rules, the pip count of the remaining stock is added. If a game is blocked because no player can move, the winner is often determined by adding the pips in players' hands. In scoring games, each individual can potentially add to the score. For example, in Bergen, players score two points whenever they cause a configuration in which both open ends have the same value and three points if additionally one open end is formed by a double. In Muggins, players score by ensuring the total pip count of the open ends is a multiple of a certain number. In variants of Muggins, the line of play may branch due to spinners. In British public houses and social clubs, a scoring version of "5s-and-3s" is used. The game is normally played in pairs (two against two) and is played as a series of "ends". In each "end", the objective is for players to attach a domino from their hand to one end of those already played so that the sum of the end dominoes is divisible by five or three. One point is scored for each time five or three can be divided into the sum of the two dominoes, i.e. four at one end and five at the other makes nine, which is divisible by three three times, resulting in three points. Double five at one end and five at the other makes 15, which is divisible by three five times (five points) and divisible by five three times (three points) for a total of eight points. An "end" stops when one of the players is out, i.e., has played all of his dominoes. In the event no player is able to empty his hand, then the player with the lowest domino left in hand is deemed to be out and scores one point. A game consists of any number of ends with points scored in the ends accumulating towards a total. The game ends when one of the pair's total score exceeds a set number of points. A running total score is often kept on a cribbage board. 5s-and-3s is played in a number of competitive leagues in the British Isles. For 40 years the game has been played by four people, with the winner being the first player to score 150 points, in multiples of five, by using 27 bones, using mathematical strategic defenses and explosive offense. At times, it has been played with pairs of partners. The double-six set is the preferred deck with the lowest denomination of game pieces, with 28 dominoes. In many versions of the game, the player with the highest double leads with that double, for example "double-six". If no one has it, the next-highest double is called: "double-five? ", then "double-four? ", etc. until the highest double in any of the players' hands is played. If no player has an "opening" double, the next heaviest domino in the highest suit is called - "six-five? ", "six-four?". In some variants, players take turns picking dominoes from the stock until an opening double is picked and played. In other variants, the hand is reshuffled and each player picks seven dominoes. After the first hand, the winner (or winning team) of the previous hand is allowed to pick first and begins by playing any domino in his or her hand. 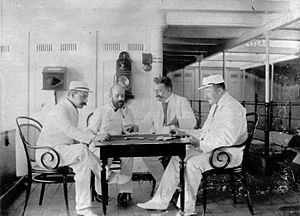 Playing the first bone of a hand is sometimes called setting, leading, downing, or posing the first bone. Dominoes aficionados often call this procedure smacking down the bone. After each hand, bones are shuffled and each player draws the number of bones required, normally seven. Play proceeds clockwise. Players, in turn, must play a bone with an end that matches one of the open ends of the layouts. In some versions of the games, the pips or points on the end, and the section to be played next to it must add up to a given number. For example, in a double-six set, the "sum" would be six, requiring a blank to be played next to a six, an ace (one) next to a five, a deuce (two) next to a four, etc. The stock of bones left behind, if any, is called the bone yard, and the bones therein are said to be sleeping. In draw games, players take part in the bone selection, typically drawing from the bone yard when they do not have a "match" in their hands. 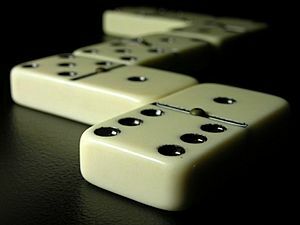 If a player inadvertently picks up and sees one or more extra dominoes, those dominoes become part of his or her hand. A player who can play a tile may be allowed to pass anyway. 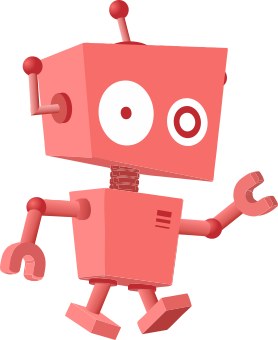 Passing can be signalled by tapping twice on the table or by saying "go" or "pass". Play continues until one of the players has played all the dominoes in his or her hand, calls "Out! ", "I win", or "Domino!" and wins the hand, or until all players are blocked and no legal plays remain. This is sometimes referred to as locked down or sewed up. 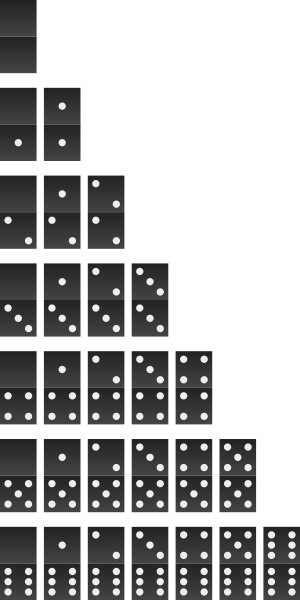 In a common version of the game, the next player after the block picks up all the dominoes in the bone yard as if trying to find a (nonexistent) match. If all the players are blocked, or locked out, the player with the lowest hand (pip count) wins. In team play, the team with the lowest individual hand wins. In the case of a tie, the first of tied players or the first team in the play rotation wins. In games where points accrue, the winning player scores a point for each pip on each bone still held by each opponent or the opposing team. If no player went out, the win is determined by the lightest hand, sometimes only the excess points held by opponents. A game is generally played to 100 points, the tally being kept on paper. In more common games, mainly urban rules, games are played to 150, 200, or 250 points. Score being kept by houses: The player at left has 75 points and the player at right has 115 points. In some games, the tally is kept by creating houses, where the beginning of the house (the first 10 points) is a large +, the next 10 points are O, and scoring with a five is a /, and are placed in the four corners of the house. One house is equal to 50 points. In some versions, if a lock down occurs, the first person to call a lock-down gains the other players bones and adds the amount of the pips to his house. If a person who calls rocks after a call of lock-down or domino finds the number of pips a player called is incorrect, those points become his. Besides playing games, another use of dominoes is the domino show, which involves standing them on end in long lines so that when the first tile is toppled, it topples the second, which topples the third, etc., resulting in all of the tiles falling. 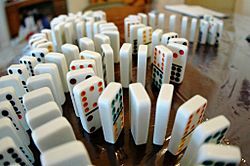 By analogy, the phenomenon of small events causing similar events leading to eventual catastrophe is called the domino effect. Arrangements of millions of tiles have been made that have taken many minutes, even hours to fall. For large and elaborate arrangements, special blockages (also known as firebreaks) are employed at regular distances to prevent a premature toppling from undoing more than a section of the dominoes while still being able to be removed without damage. The phenomenon also has some theoretical relevance (amplifier, digital signal, information processing), and this amounts to the theoretical possibility of building domino computers. Dominoes are also commonly used as components in Rube Goldberg machines. This record attempt was held in the WTC Expo hall in Leeuwarden. The artist who toppled the first stone was the Finnish acrobat Salima Peippo. At one time, Pressman Toys manufactured a product called Domino Rally that contained tiles and mechanical devices for setting up toppling exhibits. In Berlin on 9 November 2009, giant dominoes were toppled in a 20th-anniversary commemoration of the fall of the Berlin Wall. Former Polish president and Solidarity leader Lech Wałęsa set the toppling in motion. Dominoes Facts for Kids. Kiddle Encyclopedia.